Take a moment with these all-natural, bite-sized treats inspired by your favorite varietals. If only we could go through the day in our cozy pants, sipping a glass of wine. The creators of these all-natural, vegan gummies were thinking similar thoughts when they came up with the idea of bite-sized treats inspired by your favorite varietals. There's no alcohol in them, so that relaxed and indulged feeling can happen any time of day: after lunch at your desk, post-yoga, grocery shopping on a Sunday afternoon, to name a few. Give the elegantly packaged set to mom, the mom-to-be, or a friend who knows the importance of taking a moment. Made in the Netherlands. Perfect for a breastfeeding mom! I also bought the trio for my sister-in-law. She loves the fact that she can chew them anytime...especially at work! I love uncommon goods because their products are, well, uncommon. And i've Yet to make a purchase which wasn't a quality product. 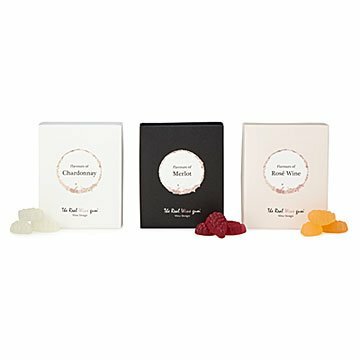 The wine gummies are a prime example found neither in stores nor elsewhere online. We got this for our roommate who loves wine and gummies. This was the perfect combo to make a great gift! I would have liked it if there was actually wine in the gummies instead of them just being wine flavored. However, our roommate was over the moon! She loved them! Not what I bargained for, it came to $10.00 per ounce. Very dissatisfied when I saw the amount of product. 39 bite size pieces of candy for $30.00. Also no wine in the product, just flavoring. It was to be a gift. I can't give this. I am not at all happy with this product. I think it is falsely advertised in the catalog. I thought this was a unique gift idea since my daughter and son-in-law enjoy wine. It's a great in between snack for both to enjoy! Let's be real here. Who doesn't love wine? This wine gift is a guaranteed success as part of a dinner or celebration. The perfect ice breaker to start a new conversation.